Could Your Parents Travel Like a Backpacker? It’s been so busy these past few months, we haven’t been able to write about how awesome it was to have our parents visit us! 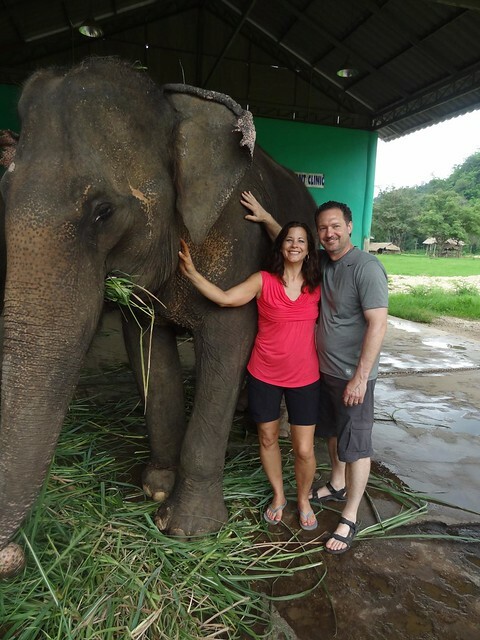 My parents visited us in Thailand in June, and it was a crazy trip. 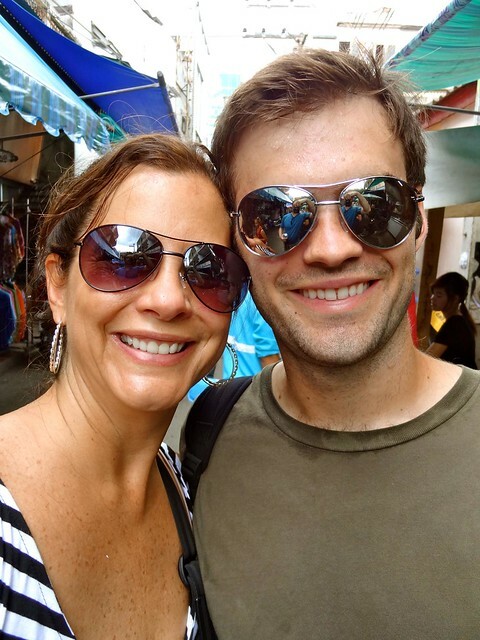 We had just finished a few months of overland travel in Southeast Asia, but had skipped most of the big attractions in Thailand since we knew we wanted to see them with my parents. This meant we were up and going every day seeing something new and exciting. This was the first time we’d traveled abroad with any of our family members, so we didn’t know what to expect. Are they going to want to travel like we do? Will the places we stay be nice enough? Will they have fun? Luckily, the answers were Yes, Yes, and Yes. 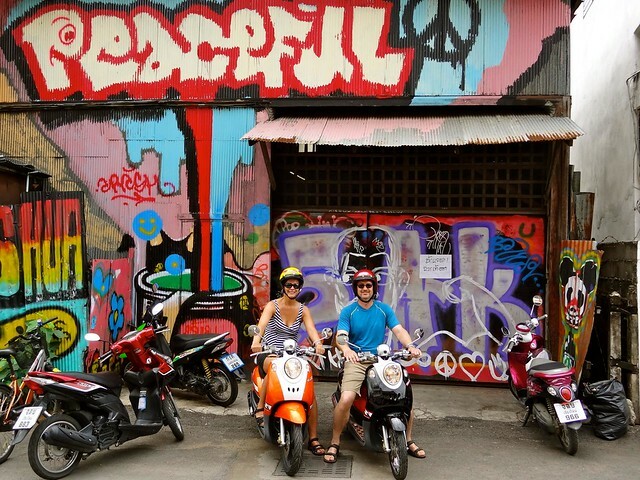 We had just over a week split between our two favorite cities, Bangkok and Chiang Mai, to explore everything they had to offer, and explore we did. We stayed at our favorite Bangkok hostel, Lub d. Yes, that’s right. My parents stayed in a “hostel”. Now, sure, Lub d isn’t just any hostel, but come on, these are my parents! Apparently they are natural-born backpackers. We explored the Grand Palace, Wat Pho and Wat Arun and took a stroll down Khao San Road. It wasn’t all 5 star dining either. It was street food, street food, street food. Of course, there’s no other way to eat in Thailand, but you never know how one will react with the food from the street. 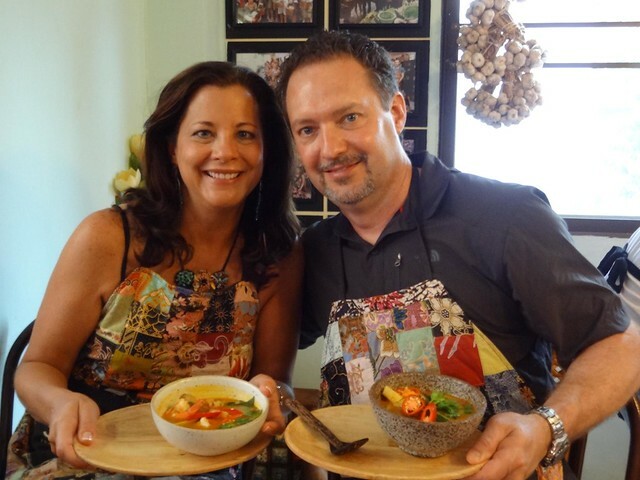 If you think that Care and I appreciate Thai food, you obviously haven’t met my mom and dad. It makes you appreciate the food that much more when its validated by how much someone else loves it. We think it’s pretty great, and they were over the moon about it! Especially at our Thai cooking class in Silom. 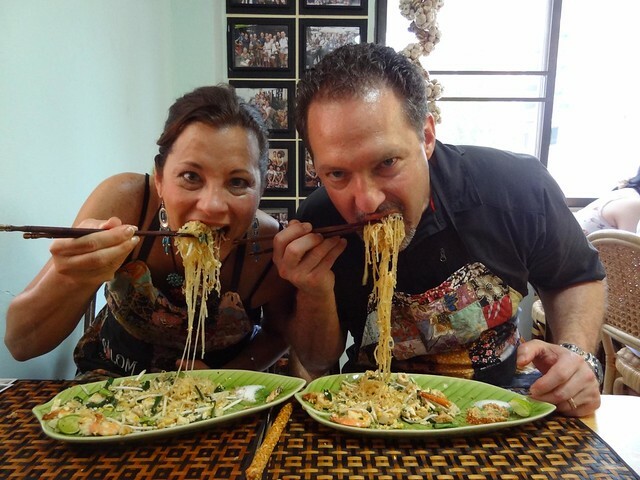 Ravenously attacking the Pad Thai! After all the temples, Chinatown and food in Bangkok it was off to Chiang Mai. We could have flown, but instead we took an overnight train. (Backpackers!) As far as Thai transportation goes, this is a pretty comfortable way to travel. That is, if it’s not rainy season. We were woken up at 5 AM and told there was a landslide and so we’d have to get off the train and take a bus the rest of the way. Not ideal, but not too bad. 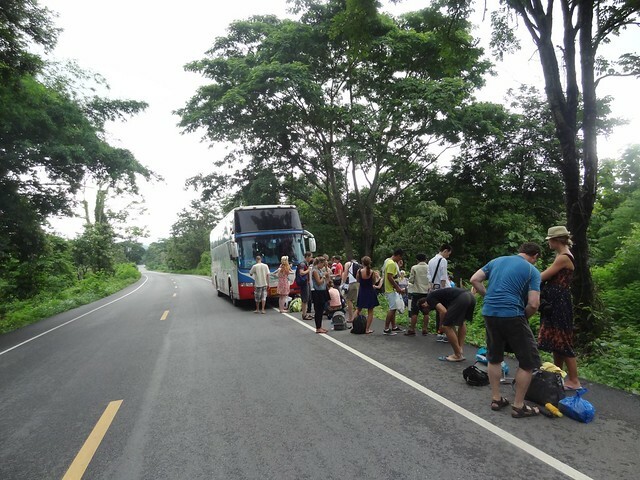 We get on the bus, and we’re driving up these steep hills, still about 3 hours from Chiang Mai when the bus starts slowing down. It’s going to break down. And then it does. We’re stuck at the top of the hill, in the middle of nowhere. We wait about an hour, and they send another bus to come pick us up. We’re finally able to get on that bus and make it to Chiang Mai, about 5 hours later than we planned. The backpackers didn’t bat an eye through the whole thing. 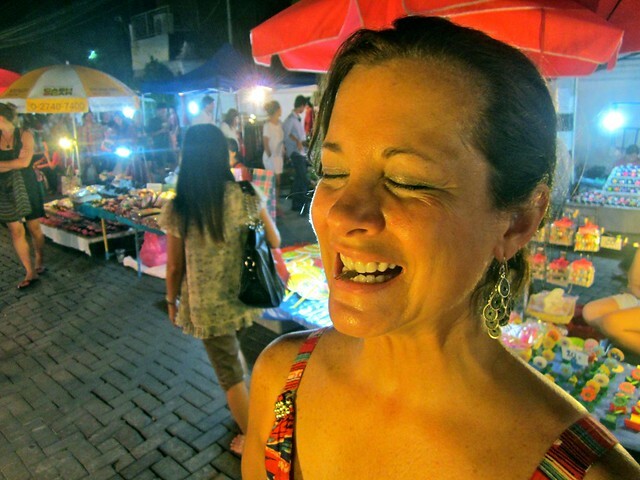 We spent the first night exploring every inch of the Chiang Mai Sunday Night Market. (I think they ended up with an extra suitcase full of Thai goods…) The next day was off to Elephant Nature Park to get up-close with some beautiful Asian elephants. 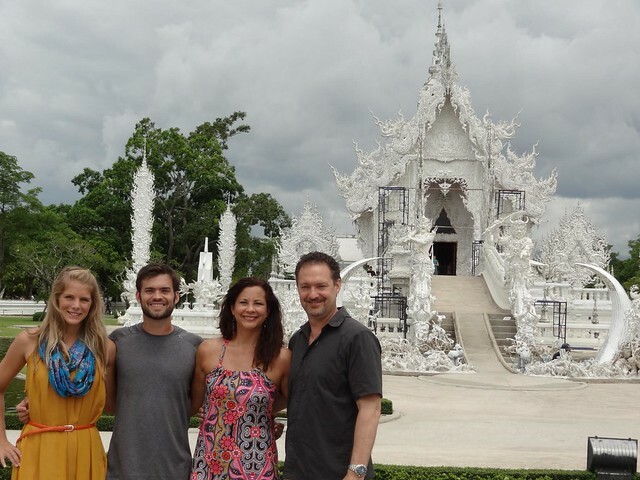 We toured the white and black temples of Chiang Rai. 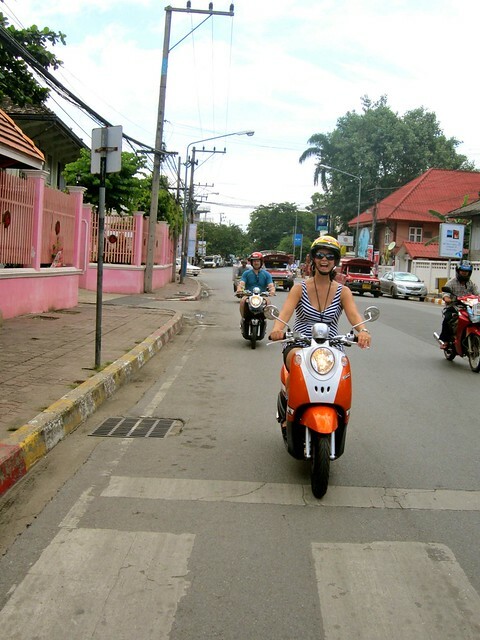 And even participated in our favorite Thai pastime, riding motorbikes. To top it all off, my mom ate a cricket at the night market. A whirlwind trip through Thailand proved that my parents could backpack with the best of them and they probably had more energy than we did! 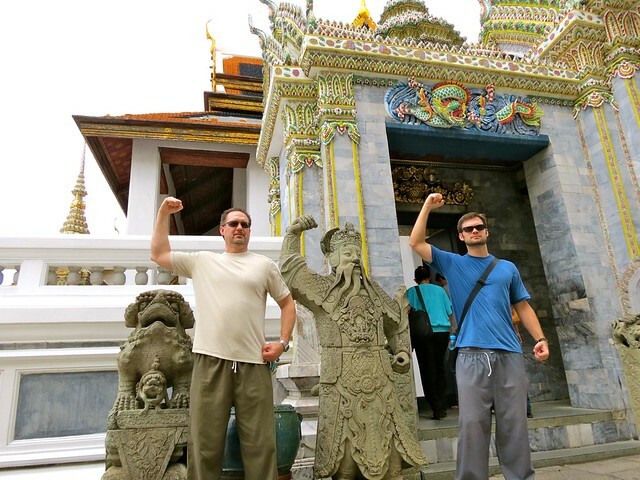 Could your parents backpack through Southeast Asia? I love being called “well behaved!” This trip was so awesome, I would do it all over again and wouldn’t change a thing. Including the bus breaking down! I actually travel with my mother quite a bit. She’s 67 and always up for adventure, including some easy hiking. In fact, we always have more fun when she’s along. We bring her on almost every trip. That’s wonderful that your mother is always up for adventure and travel! Such a great trip to an amazing country. Made even better with our awesome tour guides – you! The pictures show how happy we were to be in Thailand. I still crave that street food every day, I’m convinced there is no where in the world with better food. And the cricket tasted like chicken…. It was amazing, we were so happy that you guys joined us! Your parents look younger than we do! Good for you for travelling together must have been pretty special. Great that you had such a good time with your parents! Mine are with me in Australia at the moment and we’re having a great time! Hope to get them to Asia next! Well we hope to get ours to Australia – so we can swap! We found talking about our expectations and travel styles before we started traveling with our parents helped a lot!